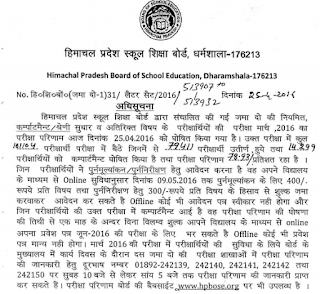 Himachal Pradesh Board of Secondary Education (HPBOSE) had declared the result of Plus Two (12th) class on 25 April 2016. The written exams were held in March 2016 for regular, Compartment, revaluation etc. candidates. Here you can check HPBOSE Plus Two Exam Result 2016 from the direct link given here. A total of 161104 students have appeared for these exams out of which 79411 have passed while 14299 have got compartment. HP Plus Two exam result was 78.93%. Those students who want to apply for revaluation / rechecking, can apply online up to 09 May 2016. Offline application forms will not be accepted. Compartment exams will be held in June 2016. Along with the result of all students, HPBOSE had also declared List of Top 10 Meritorious Candidates and List of Top 5 Candidates District & Stream Wise Plus Two Session March-2016. To view the HPBOSE result, you have to visit the below given website.